Here, we dive deeper into the actual mechanics of and accounting for partnership flips. As we will see, the structure has several built-in inefficiencies relative to a single owner that can monetize all of the tax benefits internally. This is not an indication the structure is undesirable, but an acknowledgement of the imperfections in what is often the best available alternative for an owner without its own tax liability. Figure 1 shows the basic legal structure for a partnership flip. A developer (Sponsor) and a tax equity investor (Tax Equity) form an equity partnership to own solar or wind assets (ProjectCo). We will refer to solar assets in the rest of this post for simplicity, but many of the same principles apply to wind. Tax equity typically provides approximately 40% of the fair market value (FMV) of the system or systems held by ProjectCo. While the precise amount varies, it typically ends up being about this amount to most efficiently monetize the available tax benefits. Debt is also sometimes, but rarely, used at the ProjectCo level. More often, sponsors who want to use leverage do so within an intermediate holding company (FinCo). The flip occurs when certain specific requirements are met. Generally, the tax investor’s allocations will flip down to 5-10% of both income and cash either on a specific date (in the case of a fixed flip) or when it achieves a specified return (in the case of a yield-based flip). In a fixed flip, the flip occurs on a specific date the parties agree to when they form the partnership. Both the flip date and partnership allocations are designed to allow tax equity to achieve a target after-tax yield on the flip date, assuming the system behaves as expected. The flip date is usually 5-9 years after the system is placed in service. In a yield-based flip, the flip occurs only when the tax equity investor achieves a predetermined target IRR. If the system performs more poorly than expected, tax equity will remain at pre-flip allocations for longer than expected, until it reaches its target yield. Yield-based flips have the added complication of the parties agreeing to the economic model that determines the returns, which is not required in a fixed flip. In Figure 3, a screenshot from Woodlawn’s partnership flip model, the tax investor achieves its target IRR (8%) during the period ending March 31, 2024. All flips give the sponsor a call option that allows it to buy out tax equity after the flip. In Figure 3, the sponsor exercises this option at the end of the second quarter after the flip. Even though the buyout is optional, the market expects sponsors will exercise it. Sponsors are in the business of long-term asset ownership. In addition, they would typically prefer not to deal with the control and reporting requirements that come with having a partner. The buyout price is usually the greater of the value of future cash flows and the amount to achieve an all-in target IRR. Some (fixed) flips may have a put option that requires FinCo to buy out their share of the partnership. Accurate accounting for partnerships requires that partners keep track of their capital accounts and outside bases. A partner’s capital account represents its relative financial ownership of ProjectCo. A partner’s outside basis represents its tax basis. For example, if a partner had an outside basis of $350 and sold its share of a partnership for $500, it would pay capital gains tax on only $150. Figure 4 illustrates the changes in capital accounts and outside basis for a typical project. Taking a step away from partnerships, IRC §50(c) says that an asset owner must reduce the depreciable basis of any asset that uses an energy credit (such as the ITC) by ½ the amount of the credit. The partners must reduce their capital accounts and outside bases by the same amount. For example, if our system’s FMV is $75M, the ITC is worth $22.5M. Tax equity is allocated 99% of the ITC ($22.3M), so its capital account and outside basis must each be reduced by $11.15M. The accelerated depreciation available for solar will cause losses for the first few years of system operation even though the project generates positive cash flow. These losses, plus distributions of cash, eventually drive tax equity’s capital account negative. In Figure 4, this happens in the period ending December 31, 2018. We mentioned earlier that U.S. partnerships can allocate income and cash items separately. However, for the IRS to respect the allocation ratios, the partners must agree to something called a deficit restoration obligation (DRO). A DRO requires any partner with a negative capital account to restore it to zero (via a capital contribution) if the partnership is liquidated. While the capital contribution is only made if the partnership liquidates, tax equity investors generally do not want any DRO to exceed 25-50% of their initial investment. Therefore, tax equity will often require the partnership to reallocate losses to the sponsor once its capital account drops below a certain level. 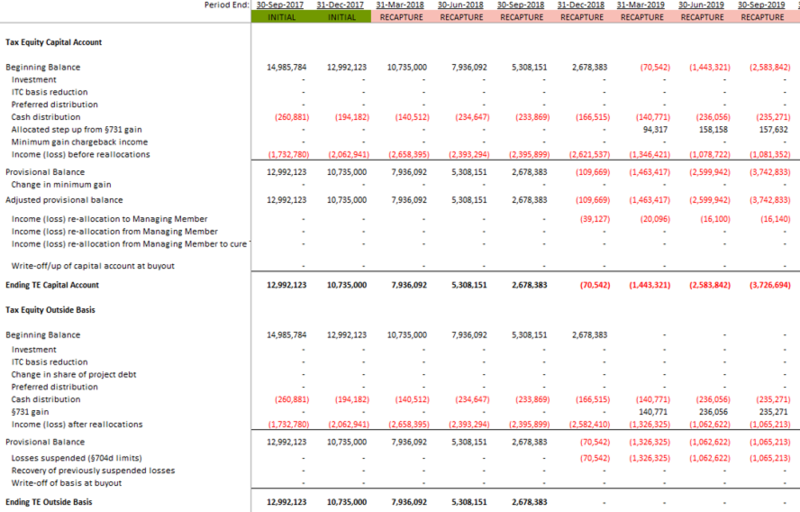 In Figure 4, see Income (loss) re-allocation to Managing Member. Notice, however, that the reallocations in Figure 4 are much smaller than would be required to prevent tax equity from having a negative capital account (and DRO). This is due to the so-called the 66 2/3% rule. Per Treasury Regulation §1.47-6, during the ITC recapture period (the first five years of operation), a partner cannot receive less than 2/3 of its original income allocations. Because of these reallocation limits, tax equity may end up with an unavoidable DRO. The reallocations merely limit its size. Reallocations are inefficient. Sponsors seek tax equity because they do not have tax liability themselves. Having losses reallocated to the sponsor, therefore, is not ideal. The partners’ outside bases increase and decrease in much the same way as their capital accounts. Unlike capital accounts, however, outside bases cannot go below zero. Losses that would drive a partner’s outside basis negative are suspended. Therefore, even if the tax equity investor does not care about the size of its DRO and does not require the partnership to reallocate any losses to the sponsor, its losses often end up being suspended at some point due to this limit. These suspended losses are carried forward and can be used to offset future income when the partner’s outside basis is positive. This is nonetheless inefficient because of the time value of money. Looking again at the period ending December 31, 2018 in Figure 4, we see that the provisional balance of the outside basis is negative. However, the $70,542 in losses that would drive it negative are suspended, leaving a final balance of zero. The partners are naturally taxed on this income; this is another often-unavoidable inefficiency. When we discussed the structure of a partnership flip, we briefly mentioned that tax equity often wants to avoid project-level debt. In theory, project-level debt could be quite attractive. Each partner can add its share of any project debt to its outside basis, limiting suspended losses and §731 gains. Project debt also creates something called minimum gains when the book value of project assets decreases below the outstanding principal on the debt; the partners add these gains to their capital accounts and therefore limit the need to reallocate losses. 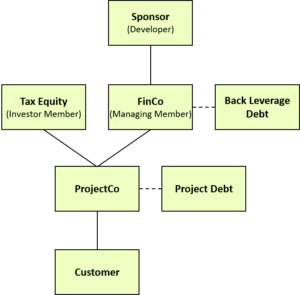 In practice, however, tax equity is typically unsupportive of using debt in the project company. Like any equity investor, it needs to consider the effect of having debt payments be senior to equity distributions. More important, however, is that any foreclosure by debt would be a change in ownership requiring ITC recapture. This would be catastrophic to tax equity’s returns. When tax equity allows project-level debt, it typically puts a 300-500 basis point premium on the flip yield and requires debt to agree not to foreclose on the asset, even if it would otherwise be entitled to, until after the recapture period. This is usually difficult for debt to accept, and it is therefore much more common to see debt used as back leverage. Investors typically use a method called Hypothetical Liquidation at Book Value (HLBV) to determine book (GAAP) income allocations for partnership flips. The traditional equity method of accounting is not appropriate when shares of ownership, income, and cash are different and vary over time, as they do in partnership flips. Under HLBV, the partners assume the partnership is liquidated at GAAP book value at the end of each period. Then, they allocate the difference between the sum of partners’ tax capital accounts and the amount received from the liquidation to the partners’ individual tax capital accounts according to a liquidation preference waterfall that is part of the partnership agreement. 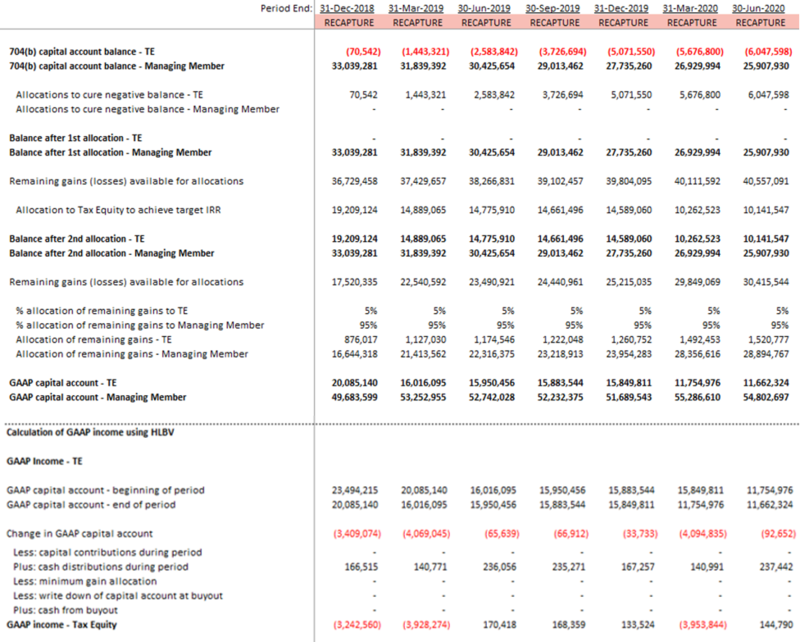 The result is the ending GAAP capital account for each partner (see Figure 5). Once the parties have their GAAP capital accounts, they can use the change between periods, with adjustments for cash distributions, to determine their GAAP income for each period. However amazingly (deviously?) clever HLBV is from an accounting perspective, it can often lead to results that are somewhat counterintuitive due to the shift allocations and differences in depreciation timing between tax and GAAP accounting. Woodlawn would be happy to answer any questions you might have about tax equity structuring and investments. Please feel free to contact Micah Sussman or Josh Lutton. You may also be interested in our partnership flip model. Thanks for this nice article! It’s the best article (after I’ve researched online for more than one week) introducing the partnership flip method! Taxable Income (Partnership) = Taxable Income (Tax Equity) + Taxable Income (Developer). Since the 731 gain is an addition to the Taxable Income within the Partnership, will this 731 gain increase the overall tax for the partnership? Besides, how 734(b) basis (or “Step up from 731 gain” in the capital account) link to the 731 gain? Section 731 states a partner (not the partnership) recognizes a gain to the extent it receives a distribution greater than its outside basis. The partner who recognizes the gain pays the tax. Section 754 and 734 state that a partnership may adjust its basis (sometimes called “inside basis”) by the amount of the gain. The partners also step up their capital accounts by the amount of the gain, with each partner getting a share proportionate to its allocation of partnership income. Thank you so much for your answer, Micah. 731 gain will lead to 734(b) inside basis adjustment, 734(b) basis adjustment will change the taxable income for the partnership (e.g. increased depreciation), and then there will be a new 731 gain driven from the changed taxable income, isn’t this an infinite loop? Section 731 gains do not cause an infinite loop because they are meant to zero out the outside basis. The 734 adjustment is just a representation of that income in the capital account. I would be happy to have a further conversation with you and Woodlawn Associates would be happy to advise you further privately. Please feel free to email me or call if you have further questions.